Beyond the Pale | A White Sneaker Round-Up. | A Continuous Lean. Beyond the Pale | A White Sneaker Round-Up. Growing up, my dad used to refer to white sneakers as “nurse’s shoes.” Oh, how the times have changed. White sneakers are now the shoe, the singular sneaker that I can honestly say everyman needs. Regardless of your respective style, no wardrobe is complete without a pair of blanked out sneakers. From Italian leather lace-ups, to dirt cheap plimsolls, the sneaker marketplace is inundated with white sneakers of all material, shape, and price. To help you chart your own course through this sea of white, we’ve rounded up our favorite colorless lace-up sneakers. Wear ’em till they’re no longer white, and then start all over again. Urban Outfitters has $10 white plimsolls. Hard to beat that. Not sure what it is, but this year I tried to make the leap to white sneaks and failed. Even the OG GATs that I tracked down just make me feel as though I am wearing Pee-Wee Herman shoes. Any advice would be appreciated. No K-Swiss? I haven’t worn anything else than the classic 5-stripe leather tennis shoe for almost as long as the company’s been in business. Wow, I’ve never seen the solid white New Balance 996’s. Not sure I could pull those off just yet. Of these, the Jack Purcells or Vans look the cleanest IMO. I also find that I like slightly off white sneakers. Billy Reid has made some in the past with KSwiss and I’m pretty sure Vans makes some. Curious what McQueen’s are in the picture. Maybe Keds? They look canvas and they have a couple vent holes on the side. 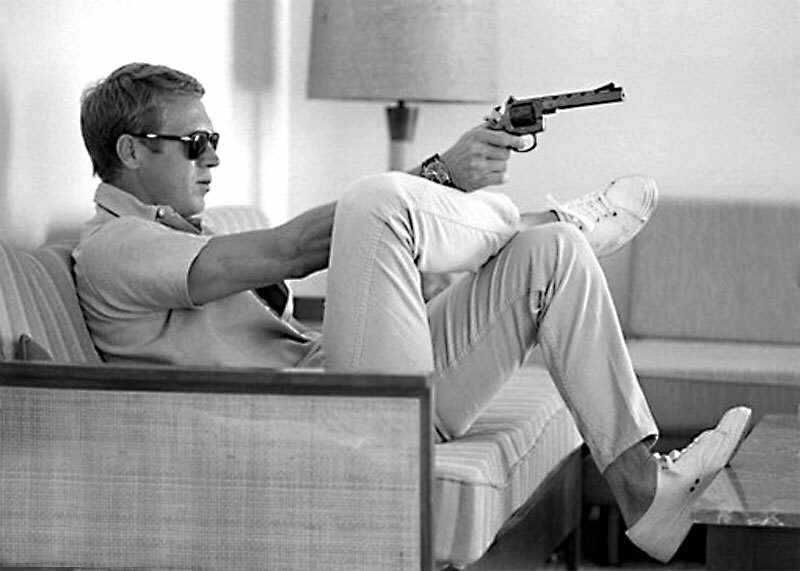 With all the McQueen idolization, I’m surprised someone hasn’t already recreated the shoes in the picture. I’m mean, haven’t we all seen this picture 100 times over? Jake and Michael, I think you need to make this happen. Also, nobody will ever pull off those NB’s. Those are dork shoes. Tell Dad there’s not wrong with nurses shoes! I always liked the thickness of the Rod Laver sole over the Stan Smith. Just bought the white common projects at the beginning of the spring and Iâ€™ve rarely taken them off since! Without question the best pair of white sneakers but come at a high price. Greatsbrand’s royale is pretty nice. Made in Italy and $165. Essentially paying for a lux sneaker at a relatively very low price. Only thing I don’t dig with the white joints is the brown hit on the top of the tongue but they’re pretty sweet and I believe should be seriously considered too. Agreed: Rod Laver in blue. White K-Swiss have always been the gold standard for me white tennis shoe-wise. Currently longing for a pair of New Balance Heritage Court 300 white/grey & i currently wear an old pair of Diadoras, white w/ kelly green stripe kinda of like the Stan Smith & Rod Laver-ish. One of the best that should be on here are Shoes Like Pottery. Made in Japan at a great price point and if anyone actually has the interest you can seek out videos of the manufacturing process and care put into these shoes. Craft and quality rather than cheap plastics and overpriced hype brands like some of the other choices. Cool shot of McQueen. Great sneaks, too. Stan Smith….Not new to this…but true to this!